Episode 1 is officially done and now episode 2 part 1 is in the works! The backgrounds are practically all done and it looks like I've finished more than 50% of part 1. 53-ish backgrounds in about 3 weeks. There are going to be more backgrounds from this point onwards so I'm willing to hire/commission any good background artist out there who want to help. Requirements are you must be good at Adobe Fireworks or Photoshop. If you are interested, just drop me an email at this address: jess_the_dragoon(at)yahoo(dot)com and be sure to send me your background artworks that you have done in the past. Please be aware that this will be paid work. >>>EDIT: Just had the free time to make a gif for that line. 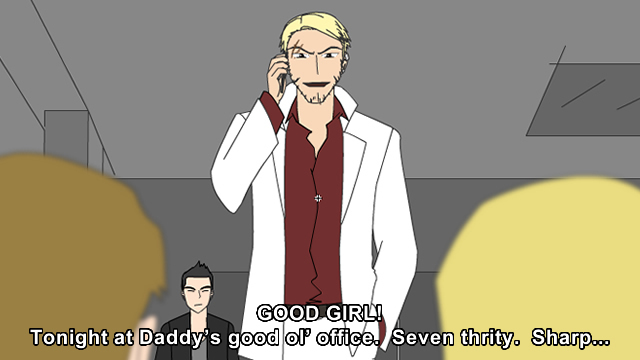 Anyone interested to be this blonde bad guy in a white suit, you can record your takes with the line of script in the image above. Please send your takes to the email mentioned above with your character voice demo reels. Welp that's that for now. I'll be away for a week from now. When I get back, I hope I can finish up episode 2 part 1!